The author has been studying solar relations in various tetrapylons of Persia, including those of Niasar, Botkhaneh, Nevis, Kheirabad, Kahak, Khaneh Div, Kermejegan, and Khowrabad, and about 20 other sites. These studies have revealed the tetrapylons’ secrets and the rules used to build them in relation to time changes and the Sun’s annual movements and declination. They have also shown that such buildings were used as a solar structure or calendric building with a sundial that was used to measure time or perform rituals. Terming tetrapylons “fire temples” was an obstacle to research and accurate analysis of facts about these structures. The theory of Persia’s tetrapylons having a relation with the sun has opened a new window into the tangible realities of the tetrapylons and initiated a new approach for studying all ancient buildings. 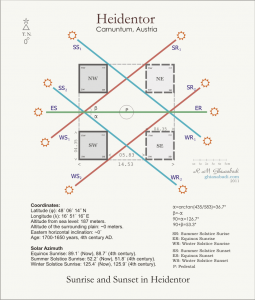 I have applied this new approach in collaboration with fans of ancient astrology and calendric buildings, and sometimes they have achieved good results through perseverance and patient work. Mr. Reza Assasi, a doctoral student of architecture at Canada’s McGill University, was greatly interested in this theory. His thesis studied the existence of such solar relations outside the realm of Persian culture, especially in tetrapylons and triumphal arches constructed under the influence of the ancient Roman Empire. Our studies show that solar relations can be also seen in Roman tetrapylons and may even exist in Roman triumphal arches, but that possibility needs more study with a larger statistical population. A European tetrapylon of the Roman Empire from the middle of the 4th century AD has been identified as the first tetrapylon used for calendric purposes in Europe, and some other sites are being studied. I believe that just as the study of the Persian tetrapylons led to the finding related to this Roman tetrapylon, special features of Roman tetrapylons will also help to reveal unexplored aspects of Persian tetrapylons. This tetrapylon is located in eastern Austria and is called Heidentor (Pagan Gate or Heathens’ Gate). The name Heidentor is an evolved form of Heydnisch Tor, which means “Pagan Gate” in German. Having been built so early in the Christian Era, it is believed to have been constructed by pagan non-Christians (probably followers of Mitra). The building is located outside the southwest walls of a Roman barrack called Carnuntum, located to the southeast of the Austrian capital city of Vienna and close to the border with Slovakia. The site is now an open-space museum called Petronell. There, on a vast, flat plain, the tetrapylon rises a short distance away to the south of the Danube River. The near zero elevation of the horizon has eliminated the need to make corrections compensating for a mountain horizon line as the angles of pillars and spaces between the east- and west-facing pairs of pillars conform to the declination of the Sun. The Heidentor tetrapylon dates back to about 1650–۱۷۰۰ years ago, having probably been built between 354 and 361 AD, under the rule of Constantius II. In these early decades of the fourth century, Christianity had not yet become the region’s official religion. 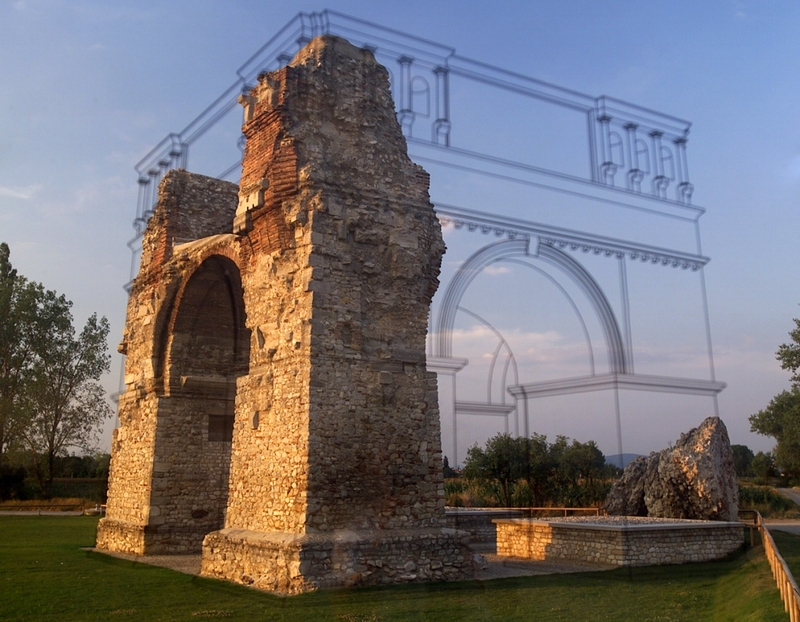 Today, the building is known as a triumphal arch or tetrapylon built to pay tribute to the Roman emperor. Specifications of the building, however, suggest that it might have been related to the Mitran religion or Arianism, the first form of Christianity in the region that was influenced by Mitran teachings. The Heidentor tetrapylon is a quadrangular building constructed on a square base with four pillars and four arches. 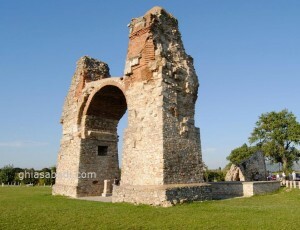 The two western pillars are still intact, but the two eastern ones have been destroyed over time. The building is made of stone, and part of the collapsed eastern side can be still seen in the form of huge boulders. The four corners of the Heidentor tetrapylon (similar to its Persian counterparts) look out over a vast expanse of plain with no wall, door, or window. Each side of the building is 14.53 m long, with pillars measuring 4.35 m, and the distance between each pair is 5.83 m. The ratio of the length of pillars to the length of the building is 1:3.34. The area is 211.12 m. The dome was probably shaped like a short quadrilateral pyramid. On the inner, southern side of the northwest pillar is a small shelf, the use of which is unknown. A similar shelf can be seen on the inner, southern side of the northwest wall of Niasar tetrapylon. Is the similarity coincidental or did such shelves serve a special purpose? This question remains unanswered. At the middle of the tetrapylon, stands a pedestal that seems to have held a statue, perhaps that of Mitra or the emperor. Such a pedestal at the center of the building is an important feature not seen in Persian tetrapylons. Similar cases may be found to prove that such buildings were connected to the Mitran religion. Temples of this religion were destroyed almost simultaneously in Zoroastrian Persia and Christian Europe. Its followers were suppressed and persecuted. The name “Idol House” or the “House of Statue” on Persian tetrapylons supports this assumption. 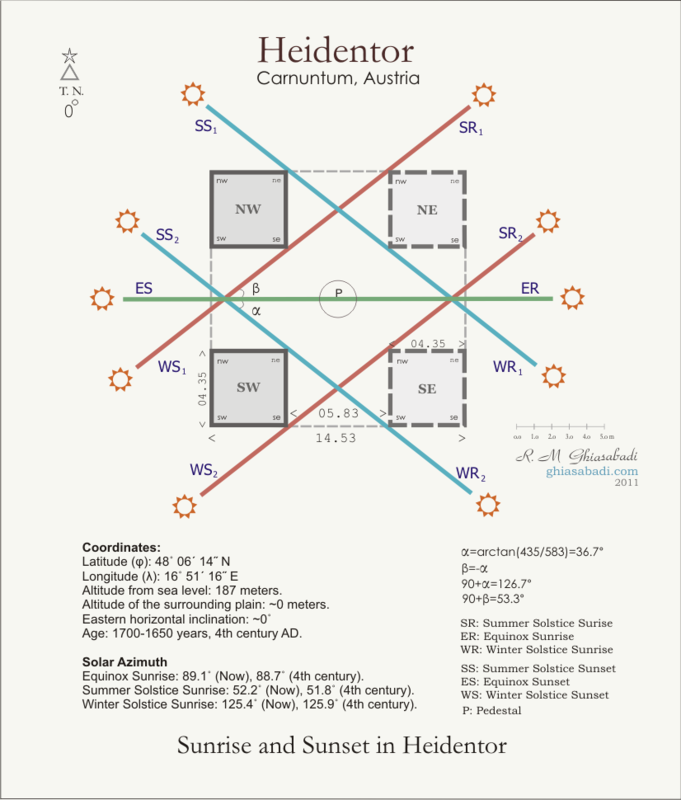 As shown in the map, during the four seasons of the year and in a cross-like space created by the pillars, the sun’s rays would have circled the statue and revolved around it. The Heidentor tetrapylon is 187 m above sea level, located at 46 degrees, 6 minutes north latitude and 16 degrees, 51 minutes east longitude. As a result, the location of sunrise is across 52.2 degrees latitude (36.9 degrees above east) at the summer solstice and across 125.4 degrees latitude (36.3 degrees below east) at the winter solstice. The angle between the two solstices is 73.2 degrees. The axis of the building faces the four major directions with one degree declination toward the west, which causes sunrise to align with the building’s axis and exactly across the middle of the statue at the vernal and autumnal equinoxes. The angle between the astronomical alignment of the vernal and autumnal equinoxes is 73.4 degrees, which is remarkably within 0.2 degree of the angle between the summer and winter solstices. The axis of the building and the ratio of the length of the pillars to the distance between them, as well as the resultant angles, are such that at the beginning of each season, the rays of sunlight shine on the measured corners of the building at sunrise and sunset, conforming to changes in solar declination, and can be seen through holes between the building’s pillars. A map of this feature of the Heidentor tetrapylon provides an excellent example of tetrapylons reflecting solar relations. As the map shows, astronomical alignment lines are very similar to those in the Kermejegan tetrapylon. The building’s east-west axis faces the points of sunrise and sunset at the vernal and autumnal equinoxes when the sunrise is along ER and sunset is in the opposite direction, along ES. At the summer solstice, sunlight falls along the SR1 and SR2 astronomical alignment lines at sunrise and along the SS1 and SS2 astronomical alignment lines at sunset. At the winter solstice, the light at sunrise is along the WR1 and WR2 astronomical alignment lines and at sunset is along the WS1 and WS2 astronomical alignment lines. Because of the building’s symmetry, sunrise at summer solstice is at the same angle of declination as sunset at summer solstice, but in opposite directions. In terms of structure and details, calendric and solar features, and age and time of construction, the Heidentor tetrapylon is very similar to the Persian tetrapylons. This interesting finding will not only be useful to studies on the history of science but can also pave the way for further studies of ancient times and analysis of the relationship between science and rituals in Persia and Europe.